In the 1960s, Rue Franklin was far removed from the premier French restaurant it would become. Back then, it served as a coffeehouse and folk music venue, catering to students who frequented the Grosvenor Reference Library, then at the corner of Franklin and Edward. It wasn’t until 1980 that its owners, Andree and Joel Lippes, took the leap to classic French fine dining—a bold venture in a downtrodden city. The move to French formality was inspired by a mixture of boredom, customer demand for expanded dinner service, Ms. Lippes’ upbringing in Morocco and Paris, and a visit to Ms. Lippes’ family in France, where the couple reveled in authentic dining experiences. Remedy House's floor greets you with French phrase "courage sans peur," or courage without fear. By the time Rue shuttered in 2017, it had changed ownership. And while the kitchen was still putting out impressive plates, so were others in town, and they were doing it at lower prices and at venues that felt more quotidian. In the immediate aftermath of Rue’s closing, longtime supporters bemoaned the end of an era and a certain void in the local restaurant scene. “When you walked in the door you were not in Buffalo anymore,” reminisced one Facebook commenter. Today, there are still opportunities for transportive, thematically French dining experiences, but they are of a more approachable sort. French food in Buffalo has democratized. Remedy House was modeled after a classic Parisian cafe. Coffee is sourced from Toronto-based small batch roaster Propeller Coffee. Take, for instance, the current best opportunity to indulge your inner Francophile. It is not in a refined dining room but at Remedy House, in a historic angular storefront where Rhode Island and West Utica meet diagonally at a peak. Remedy House’s unique physical space, which follows the lines of the dramatic intersection, was meticulously designed in the spirit of classic Parisian sidewalk cafés to leverage its relationship to the street and convey a sense of timelessness and permanence. Weather permitting, floor-to-ceiling sliding glass doors open the cheery, sun-lit interior to a wraparound, awning-covered patio, where a diverse clientele can be found at small round tables and rattan chairs soaking up the atmosphere over espresso drinks, amari, beer, and wine from a menu heavy with small French producers. Food, too, leans French. 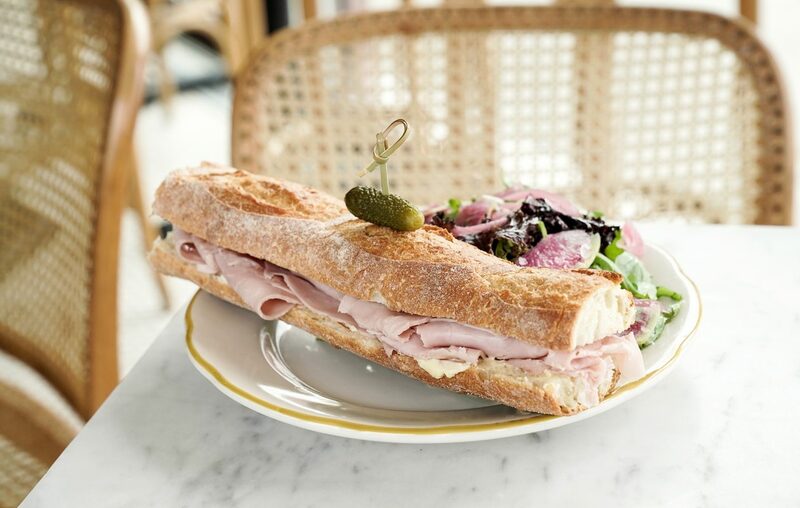 Tartines and uncomplicated snacks like proper cheese and charcuterie and warm Marcona almonds are mainstays, as is a standout jambon beurre—the so-simple-it’s-easy-to-get-wrong sandwich that’s been a mainstay of Parisian culture since the 19th century. Made at Remedy House from carefully sourced products, including jambon de Paris, a delicately spiced, slow-cooked specialty ham; cultured Les Prés Salés butter with coarse Camargue sea salt; and crackly crusted baguette from Elm Street Bakery, it’s as good as any you might pick up along rue Charlot. Croissants from pop-up patisserie Butter Block are a staple at Remedy House on Buffalo's West Side. It wouldn’t be a mind-trip to Paris without pastry, and in that arena Remedy House is also a must, thanks to its relationship with Butter Block, a pop-up patisserie whose viennoiserie is without parallel in the city. Try the twice-baked, rum-accented almond croissants for one of the very best bites of food—pastry or otherwise—to be had in Buffalo. In time, you’ll also be able to find them at Butter Block’s own retail bakery, along with various other traditional and innovative pastry, cookies, tarts and cakes. Alternative French-inspired dining options in town include Pastry by Camille, where a raucous, slapdash color scheme and mismatching knick-knacks befit the rough-hewn pastry and bread programs. Best bets are the savory, crepe-like buckwheat galettes, a specialty of the French region of Brittany, the birthplace of chef-owner Camille Le Caër. Pastry by Camille's Ma Complête galette is made with local eggs, ham and gruyere cheese. Bistro experiences in the vein of France’s provincial mom-and-pop establishments can also be had in Buffalo. In the Theatre District, Sandra Wilkins operates Raclettes with her husband Paul. There, servers have been known to say bonsoir, and guests can tuck into the rich, hearty fare that earned the French their reputations as gastronomic bon vivants. Dishes like boeuf bourguignon, cassoulet, moules frites and croque monsieur were inspired by the Wilkins’ annual trips to Paris and come from recipes given to them by a French, Cordon Bleu-trained relative, while local chef Glenn Fraccica brings “Buffalo attitude” to the menu with continental spins on hometown favorites like duck wings with Roquefort dressing. Raclette's melt-in-your-mouth boeuf bourguignon is one of the Main Street bistro's most beloved dishes. Ironically, the French experience in Buffalo today is more akin to Rue Franklin’s folksy origin than its refined legacy. But even back in 1990, Mr. Lippes saw the writing on the wall, observing that more casual French concepts were gaining steam across the country. “Buffalo is a price-conscious city,” he conceded before asserting his refusal to change with the tide. Comprising their vision was never an option for the Lippes, and so its legacy lives on as others fill in the gap…but make no attempt to take its storied place.